Scandinavian games developer Yggdrasil has brought an Antarctic flavour to the hottest of summers, with its new Penguin City online slot. The game, featuring the flightless favourites, hit casinos this week and is already proving popular. The evil Emperor Penguin is holding his subjects captive in the infamous Penguin City, and you need to help. It won’t be easy, but it will be fun. With a fun Escape Mode bonus, sticky and stacked Wilds, plus copious respins, these ice-loving avians could help you to a cool win or two. So stick on the fan, grab a cool drink and get ready to p-p-p-pick up Penguin City. Here’s SpinCazino’s Penguin City slot review. What is Penguin City Like to Play? Penguin City looks fantastic. You are transported to a Chinese street scene, presumably within the Emperor’s jurisdiction, and it is stunning. The expert cartoon visuals of the Penguin City online slot strike you right away, with fun looking penguins milling about the roads, past food shacks. Soup and soy sauce drip from the table on which the reels sit, and exposed lamps glow and flicker as moths surround them. The reels feature Chinese food and kitchen implements, as well as the playing card suits. A mournful Chinese lament plays underneath the action, helping you immerse yourself in the world of the game. Yggdrasil Gaming has pulled out all the stops for the Penguin City online slot. First of all, you need to seek out a UK casino site that stocks Yggdrasil games. As one of the best up-and-coming developers, this shouldn’t be too difficult. More and more new casino sites are teaming up with Yggdrasil, as its reputation for fun gameplay and gorgeous visuals grows. Casino Cruise is a fantastic new casino site, with a great range of games, including Penguin City. Hit the link below to visit the site, sign up, deposit and play. 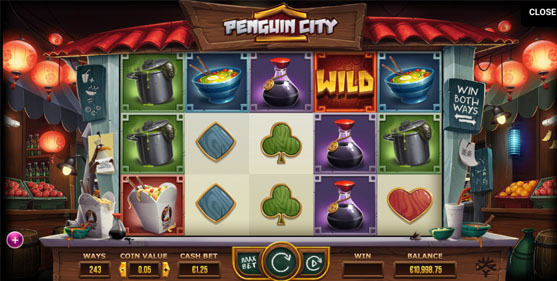 Once you launch Penguin City, you are greeted with a five-reel, 243 ways to win online slot. Set the coin value and the number of coins you’d like to wager on each spin. Alternatively, use the Max Bet button to play the toppermost stake. After that, simply strike the spin button and watch those reels fly. It’s a win both ways game, meaning you can rack up a good number of successful spins during your session on the Penguin City online slot. There are a number of great features on Penguin City that can lead to sweet wins. Escape Mode is the big deal here. If you land a Wild on the second or fourth reel on a winning spin, you’re in. The Wild stays sticky as the reels respin, keeping going until there is no winning line. You can even earn extra sticky Wilds on the second and fourth reels, with winning symbols occasionally dropping onto the third reel. It all depends on whether those escaping penguins jump on your reels during the feature. Here’s hoping they do! You can land Emperor Stacked Wilds during the Penguin City online slot, and you’ll definitely want to. This can happen in Escape Mode, and sees the big boss descend on the middle reel. He makes his way down a single row every spin, and means that you are very likely to pick up a host of respins. Penguin City uses Yggdrasil’s iSENSE 2.0+ technology that makes things so much easier for players. You can deposit funds without leaving the game, which means you don’t break your momentum. It is set to offer even more advancements in the future. Is Penguin City Worth Playing? Penguin City is a fun, stunning game that will keep you entertained. It isn’t jam-packed with features, but the ones that it does have are well worth earning. Yggdrasil has really pulled it out of the bag in terms of gameplay and creating a world that you want to be part of. In addition, you wonder if the timing of releasing a game featuring heroes that prefer the sub-zero chill to the baking sunshine is misjudged or a work of genius! Yggdrasil Gaming has been around for five years, after launching in 2013. It was the brainchild of former NetEnt executives, and there are a lot of similarities between the firms. The attention to detail, the bold graphics and fun overview certainly strike a chord. The developer was named Innovator of the Year at the 2018 International Gaming Awards. Although the Penguin City online slot won’t win any gongs for innovation itself, the company knows that creating a strong impact and great gameplay is just as important as striving to rip up the rulebook.